Debris falls following the loss of Engine 1 during Falcon 9’s October 7 flight (Credits: SpaceX). On October 7, Commercial Resupply Services Mission 1 (CRS-1) took off, with the Falcon 9 rocket carrying a loaded Dragon capsule. Everything was reported as nominal, but those watching carefully may have seen a brighter burst of flame 79 seconds into the launch, followed by falling debris. Only hours later did the news trickle out: Dragon ‘s launch vehicle was down one engine. An October 8 press release from SpaceX, designer and operator of both capsule and rocket, indicated that one of Falcon 9’s nine engines lost pressure suddenly and was automatically shut down. As programmed, the launch vehicle automatically redistributed the propellant to the remaining eight engines and compensated by extending its first stage boost by 30 seconds. 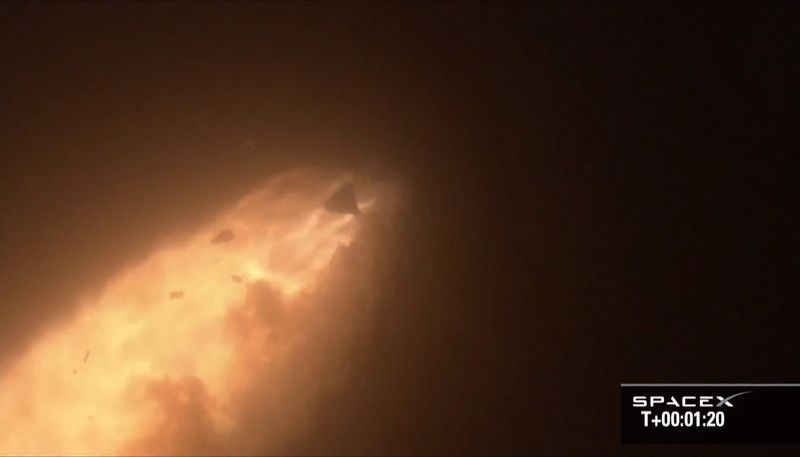 SpaceX contradicted initial rumors that the engine blew up, saying “We know the engine did not explode, because we continued to receive data from it.” The company explained the debris seen falling as ejected panels from within the engine bay normally used to relieve pressure. The Falcon 9 is designed to function with one engine out, and on this flight, SpaceX reports that the vehicle would have done just fine with two engines out, since it shuts down two engines to limit acceleration anyhow. However, pressure-related engine shut downs seem to be a recurring theme for Falcon 9, the cause of a May 19th launch abort and delays earlier in the year to reprogram the automatic shut down to be a little less trigger happy. The root cause of this incident is still under investigation. Dragon made its way to the correct orbit and is on course to rendezvous with the International Space Station on October 10, but Falcon 9’s secondary payload, an ORBCOMM satellite, was not so lucky. The satellite was placed in an incorrect orbit as a result of the engine reprogramming and loss of the upper stage’s second burn. ORBCOMM is now working with Sierra Nevada to try to raise the satellite’s orbit using onboard propulsion.